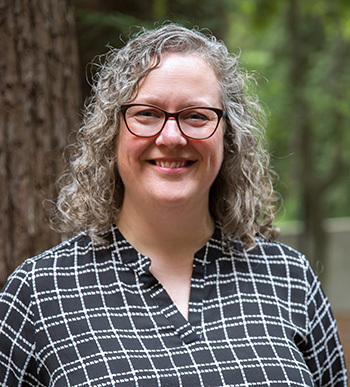 At a recent meeting of the Society for Research on Biological Rhythms (SRBR), Carrie Partch received an unusual award called Aschoff's Ruler, considered the top honor in her field. Partch, an associate professor of chemistry and biochemistry at UC Santa Cruz, is a leading researcher in the field of chronobiology, studying the molecular mechanisms of the biological clock that drives the daily rhythms of life. Jürgen Aschoff, one of the founders of the field, made fundamental observations about how animals respond to light that became known as Aschoff's Rule. 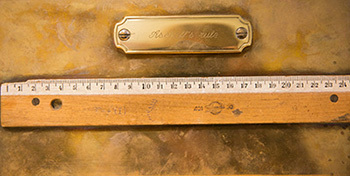 In 1991, one of the scientists Aschoff mentored, Till Roenneberg, took from Aschoff's lab the battered old wooden ruler he had used to trace patterns in behavioral data, mounted it on a bronze plaque, and began the tradition of giving Aschoff's Ruler to a top scientist in the field. Each recipient of Aschoff's Ruler chooses the next year's recipient, according to a set of guidelines. "There's no organization or committee involved. It's an honor that comes from a fellow scientist, which makes it special," Partch said. Biological clocks are ancient mechanisms, operating in organisms from algae to humans. A longstanding question about how the timing of the circadian clock is regulated in humans and other mammals has just been resolved by a recent study involving Partch's lab at UC Santa Cruz. In collaboration with researchers at the University of Michigan and other institutions, Partch investigated a key process that determines the timing of the clock. In a paper published May 21 in Proceedings of the National Academy of Sciences, the researchers identified the enzyme that carries out a critical step in this process. The new findings help explain why a certain genetic variant in a gene called PERIOD causes people to be so-called "morning larks," going to bed early and waking up early (often before 4 a.m.) every day. The variant, which changes a single amino acid in the PERIOD protein, speeds up the clock so that, instead of being on a roughly 24-hour cycle, morning larks have an internal clock with a 21-hour cycle. "We've identified a critical step that depends on this one amino acid," Partch said. "Now that we've identified the enzyme that regulates this process, we could potentially develop drugs to control circadian timing and the onset of sleep, helping people adjust to jet lag or shift work." Partch's lab developed an assay using a technique called nuclear magnetic resonance (NMR) spectroscopy that allows them to probe the molecular interactions of the clock proteins with an unprecedented level of resolution. Coauthor Sabrina Hunt, a graduate student working with Partch, performed the crucial NMR spectroscopy experiments. "It's an interesting case where understanding the effects on human behavior led us to the biochemistry of the clock," Partch said.